Construction: Covered area approx. 400m2. Built in 2010. This beautiful family residence called Eden nearby Monte Rei Golf and Country Club with large swimming pool and sun terraces has it all; a marvelous location with lots of privacy yet nearby Golf and Beach resorts. All modern comforts are provided for at the villa and with fine dining only a short walk away in the excellent restaurant called Vistas of Monte Rei. 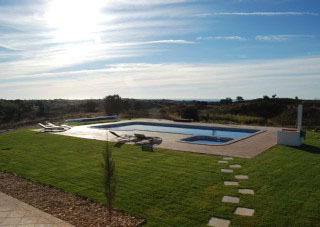 This makes Eden an ideal choice for families, small (business) groups or friends looking for a special place in a unique Algarvean setting. The villa has been furnished and decorated to a very high standard by the owners to make your stay as enjoyable as possible. 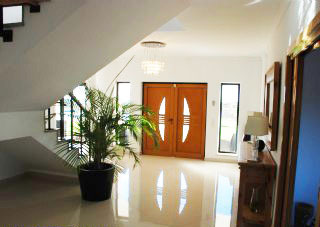 The villa consists of a spacious, light and bright hallway in the center of the house. Accessed via 2 points from the hallway, the lounge area expands to nearly 60 m2, affording plenty of room with 2 large three seater leather sofa’s, 4 comfortable single chairs and 3 Moroccan pouffees all surrounding the 50” plasma TV with DVD facility. Four large patio doors wrap around the whole area giving a feeling of even more space, plenty of natural light plus views to the pool and garden area. 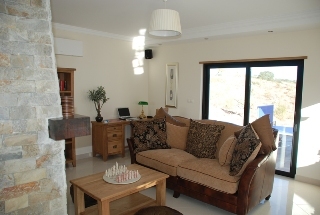 Beyond the huge Monte-Rei stone fireplace you will find the snug/study (20sqm) with large 3 seater sofa and 2 Moroccan pouffees, a library stocked with novels and Algarve information books, an oak office desk with laptop computer inc dongle WiFi is also available for your use. The whole area has been is wired with a high quality 6 speaker sound system, with CD and docking station. 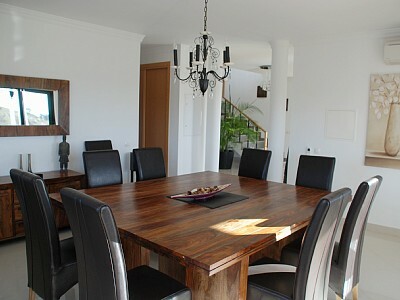 The Dining Room is again accessed via the hallway and contains a 7ft by 7ft shesham oak dining table, with 12 high back leather chairs, and independent sound system with docking station. As the dining area opens directly out via 2 sets of patio doors onto the BBQ area the sound system can pipe your favourite music outside while you eat alfresco. All the eating area’s lie on the same side of the house, with direct access from the kitchen through to the dining room and then onto the BBQ area, making it much easier to service. 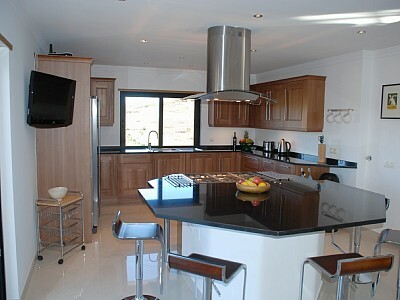 The kitchen is extremely well equipped with central extra wide 6 burner Smeg oven and extractor, wrapped around the oven, a generous granite breakfast bar, with seating for 5 or more, + 32” plasma TV. The barbeque area has a custom built Portuguese BBQ. Next to this is a sink and drainer + fridge underneath, all the area is under a roof and open on 2 sides, 12 black rattan armchairs and 2 tables makes sure everyone can sit, eat and drink in comfort at the same time. There is also a wheeled Outback gas BBQ. Facing south with views of the swimming pool, garden area and beyond down to the sea, the large wrap around balcony affords incredible views, whilst inside the master bedroom has a super king-size bed, 32” plasma TV, separate dressing area with double wardrobe and a safe, through a further door takes you to the en-suite with large walk-in shower, toilet and bidet. 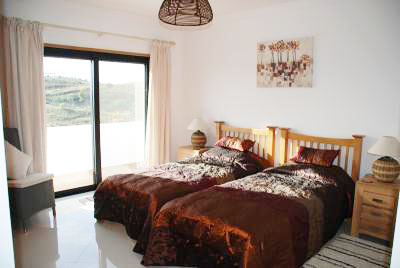 Bedroom 2 – Has twin beds and large wardrobe, with views again from the large balcony overlooking the swimming pool, gardens and beyond through the valleys and down to the sea. Bedroom 3 – Has twin beds and large wardrobe, with good sized balcony and views to the rear and the breathtaking Caldeirao Mountains. 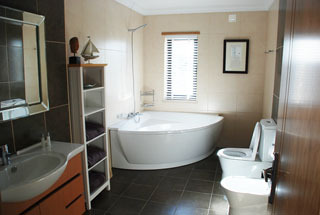 Both bedroom 2 and 3 share the large main bathroom with huge corner bath and shower, toilet and bidet. Bedroom 4 – Has a super king-size bed and large double wardrobe, plus en-suite with large walk in shower, whb, toilet and bidet. Uninterrupted views to the north from the balcony through the valleys and on to the Caldeirao Mountain ranges. Bedroom 5 – On the ground floor bedroom 5 has twin beds and a huge triple wardrobe, an en-suite bathroom with shower, toilet and bidet. Patio doors open immediately onto the large rear patio area. Bedroom 6 – Adjacent to the games room you'll find a good size double bedroom with built-in wardrobes and en-suite bathroom with walk-in shower. Patio doors open immediately onto the large patio area. Being separate from the main house Little Eden is the ideal place for noise level’s to rise with competition starting with few frames of pool on the 7’ by 4’ table, then move swiftly on to a game of Fas table football, then there may just be time for a quick couple of games of table tennis on the outdoor Cornilleau table, before retiring to the corner sofa for a quiet game of bowling, basketball or golf on the Wii !!! The 42” plasma TV also has DVD facility so if the kids want to watch a movie in peace they can, there is also a stereo docking station. The pool measures 12m by 6m with a maximum depth of 1.6m. The baby pool is 2.5m by 2.5m and has a depth of just 0.60m so is perfect for the little one’s. Both pools are salt water and give a far more refreshing feeling than normal chlorinated pools, and should you require both pools can be heated. You will find Eden on the outskirts of the Caldeirao mountain range and only 800m from Monte Rei Golf & Country Club, now listed as Portugal's number 1 golf course and in the top 10 courses in Europe. Well worth a visit even if you do not play golf! 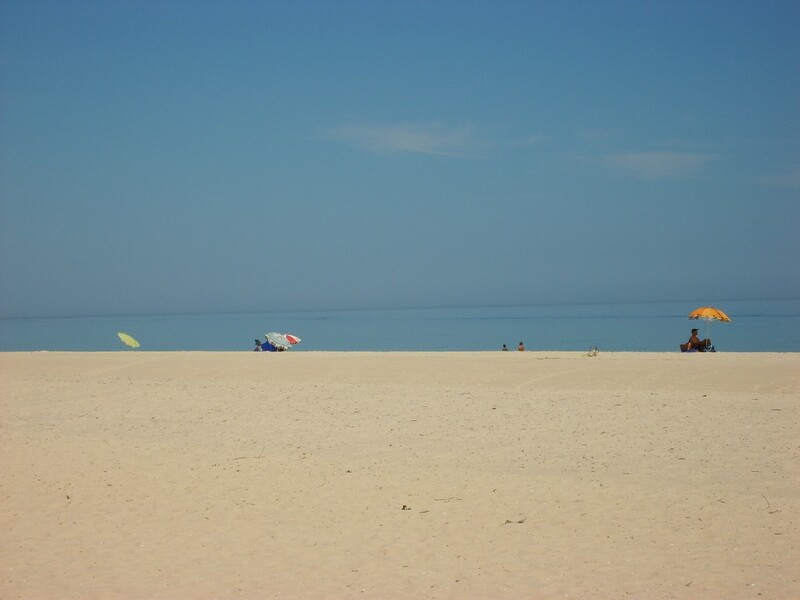 The beach is a 7 minute drive and the local village 5 minutes, with the historical town of Tavira only 10 minutes by car. To the East lies the Spanish border which you can cross in 15 minutes. A day trip to Seville is highly recommended and only an hour and a half drive away. There are many blue flag beaches in the area to choose from. 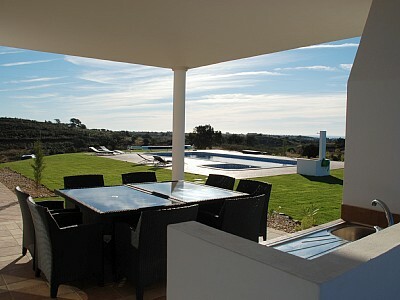 It's central location make it an ideal base to explore the Algarve. All amenities in Manta Rota - a friendly seaside village - are near by and there are many restaurants and bars to choose from. The beautiful beach of Praia Verde with it's centuries old pine forest is also well worth a visit. 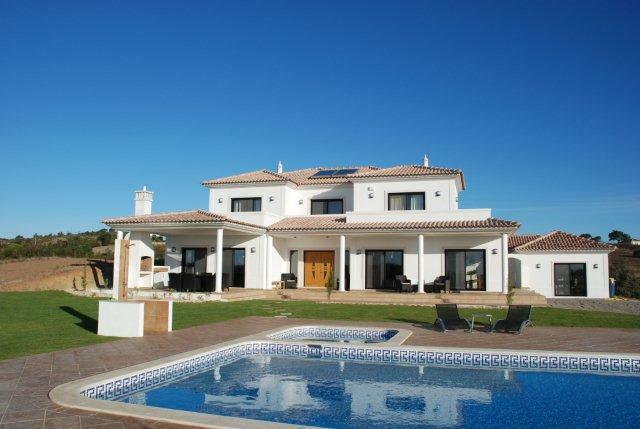 The Algarve offers most of the year the ideal circumstances to play golf and there are four Golf courses only a few minutes drive away: Quinta da Ria, Quinta de Cima, Castro Marim Golf and the most prestigious of all, the Monte Rei Golf & Country Club. The old towns of Cacela Velha and Castro Marim are also well worth a visit. If you like gambling, there is a casino in Monte Gordo as well as many restaurants offering Portuguese and international cuisine. Don't forget to visit the beautiful town of Tavira, 16 km west from Manta Rota. It is very easy to lose track of time in Tavira, a lovely old town with a rich history. You can spend hours strolling the charming cobblestone streets with it's many restaurants, shops, bars and terraces to enjoy a refreshment in the sun. Ilha de Tavira, it's famous beach with many small restaurants is only a boat ride away. The beach of Barril in Santa Luzia is also very nice. This beach is accessible by foot or if you don't like to walk, there is a small train that takes you there. Furthermore, the Ria Formosa Natural Reserve Park and the National Forest of Vila Real de Santo António are both wonderful places for long walks, bird watching or bicycle (can be rented) tours offering visitors many possibilities to observe local fauna and flora. In other words, one of many opportunities to relax and enjoy this special area in the eastern Algarve. 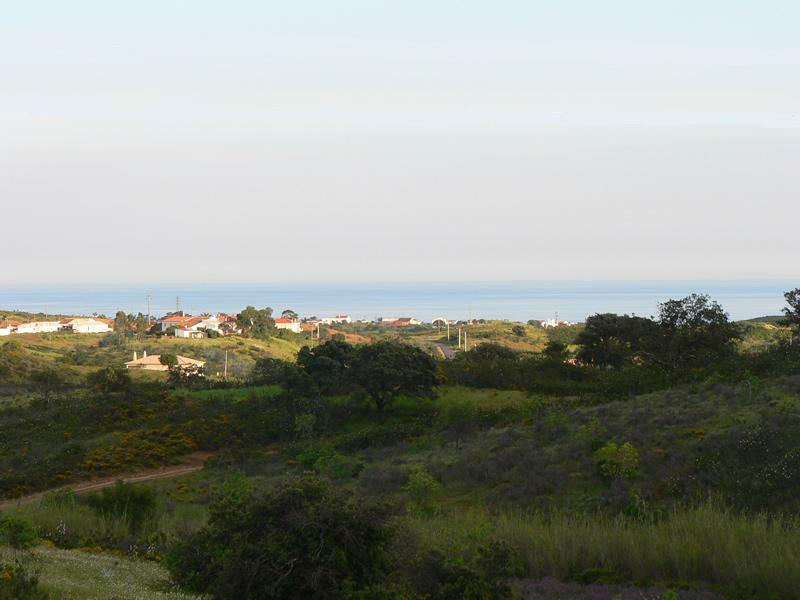 Five years ago we went to the Eastern Algarve looking for a property in an unspoilt area. We chose the Algarve as it is just a short 2 hour flight and 40 minute drive to a beautiful warm climate which is generally 20 – 25 degrees higher than the U.K. all year round, Portugal also has no time difference to the U.K. hence no jetlag. Building our first home in the village of Manta Rota (5 minutes from Eden) we successfully rented the property working alongside our management company Happy Homes in Tavira. Getting great reports from our guests as to the standards of the property it was not long before we started to look for and found an idyllic piece of land just 5 minutes back up into the hills near Monte Rei. 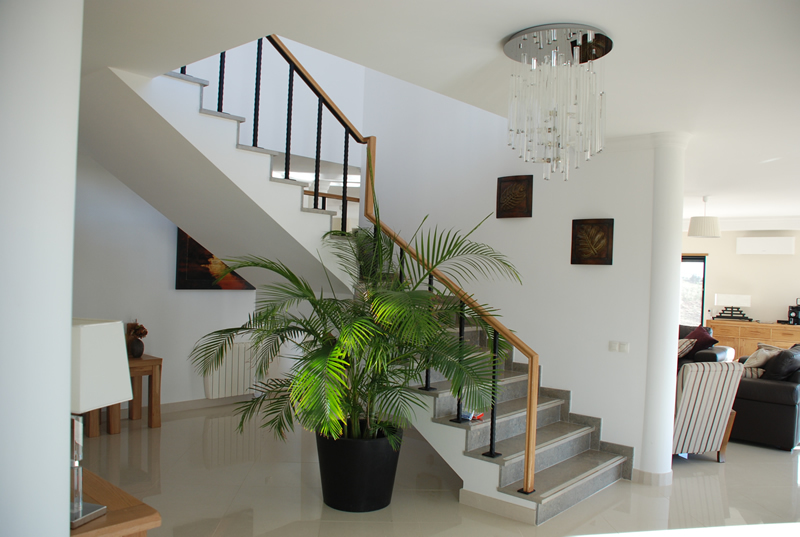 Being fastidious with all aspects of the build made the end result a fun and logical home, all furniture was premeasured to fit into it’s surroundings then sourced in the U.K. and shipped to the Algarve. This enabled us to take our time and purchase the best furnishings possible, posturepedic mattresses, choice of BBQ’s, Smeg oven and the whole kitchen that again was shipped from the U.K. The Salt water pool was a recommendation by the person who built the pool and is a new experience to anyone who has not swum in one before as it is chemical free and totally child friendly. We sincerely hope you enjoy it too……………..
Faro: 50 km; Tavira: 15 km; Spain: 20 km; Manta Rota town center: 10 km; Nearest Beach: 7 km; Praia Verde Beach: 10 km; Nearest Restaurant: 800 m; Golf : 800 m. Faro Airport: approx. 30 minutes; Seville Airport: approx. 70 minutes. This property has its own WIFI hotspot to connect to the internet, free of charge. 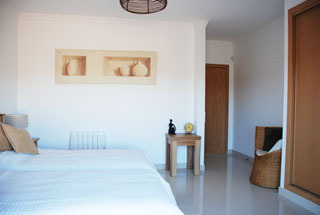 For more information, follow link accommodation with Free Wifi in the algarve. 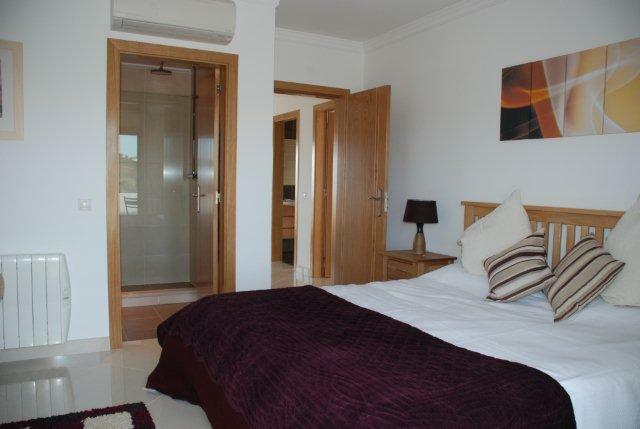 This property is available at a reduced rate for a long term stay. For more information about winter lets, extended stays and long lets, follow link accommodation for Long Term Let in the Algarve. Price is per month, excluding utilities. Minimum stay two months.. 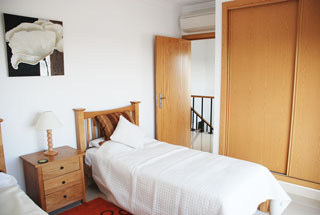 Bed linen and towels included (pool towels are included, beach towels are not included). Sorry, no pets allowed and no smoking inside the house. 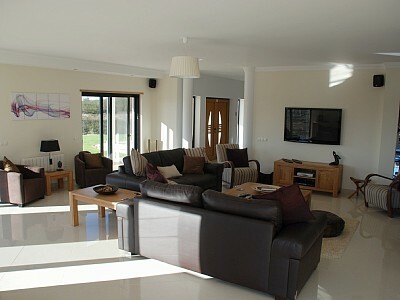 The accommodation in the Algarve featured on this website is merely a selection from our varied portfolio. Please email us your requirements for personalized recommendations.